The USFL's decision to change to a fall playing schedule for 1986 sent a number of teams to new locations in 1985, among them the 1984 champion Philadelphia Stars. Having no desire to compete directly against the Eagles in the fall, the Stars would instead attempt to fill a void recently left by the NFL in Baltimore, where the Colts had scrambled out of town in the middle of the night in March of 1984. Despite the fact that the Colts were already in Indianapolis, there were still provisions in the team's lease at Memorial Stadium that prevented the Stars, at least for 1985, from using it as their home. The team played its 1985 home games at Byrd Stadium in College Park, nearly 40 miles from Baltimore and in fact closer to Washington, D.C. Meanwhile, the team practiced and maintained their de-facto base of operations in Philadelphia. It was an odd arrangement, and one that no doubt had a hand in the Stars' relatively poor 10-7-1 regular season finish in 1985. 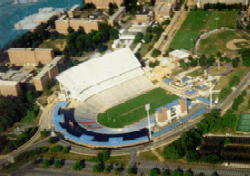 Built in 1950 as the home for the University of Maryland's Terrapins, Byrd Stadium had a seating capacity of 34,680 during its USFL days. The second tier of seats shown in the picture at left was added in 1991 as part of an expansion that also included luxury suites and increased capacity to just over 48,000. Later the stadium's seating capacity expanded to slightly over 51,000. Constructed for just $1 million, in 2006 the University of Maryland sold naming rights to the stadium for $20 million, with the facility renamed "Chevy Chase Bank Field at Byrd Stadium."